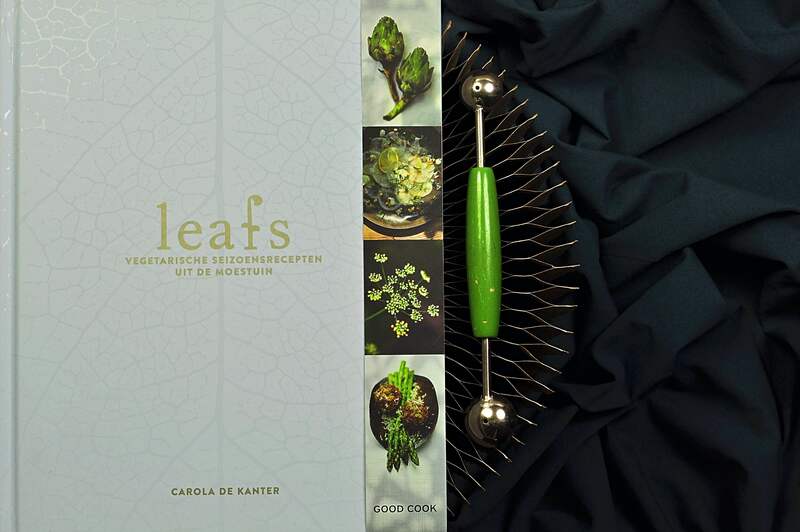 Today I’m reviewing the Dutch book Leafs by Carola de Kanter. From the book I also make a green pea soup with lemon! Cooking in season is always right and if you also have the luxury to grow, harvest and prepare your own vegetables, I suppose it’s a dream for any foodie! In the book Leafs we follow the author into her own garden from early spring to late winter. Cultivation tips are mixed with wonderful recipes and pictures in hundreds shades of green. Carola de Kanter work as a creator for recipes for various magazines, as a chef on television and giving her own cooking courses. Her thorough knowledge is reflected on the recipes and in the choice of ingredients. Often the recipes are simple to make but almost always with an exciting twist in the combinations of taste. I myself have learned some new stuff from the book that I really enjoy. Like making a “poor mans capers” from the green, big seeds after a flowering Nasturtium…. Or exploring the Parkia speciosa bean (or stink bean as it is called here …) and the asparagus bean together with a hot thai-pesto. Let’s just say, I’m sure I will have fun with this cookbook! From the book I have chosen to make a light, fresh and summer-like soup with green pea, lemon and papeda. Great just as it is or some thahini on top. Papeda can be bought both fresh or dried. If you can get your hands on fresh ones and don’t use everything at once, it works perfectly to store them in the freezer. Their leathery leaves can handle the cold well and you will be ready for the next time you want to make a spicy Thai curry, Tom sin gai or maybe a marinade for coming up bbq. The leaves add a sour, fresh taste and a delicious scent for several dishes. But let’s get to work with our soup! 1. Wash the leeks and cut them until the middle of the green section. Bake the cut leeks in some neutral oil. Peel or squeeze garlic on top and add the chopped chilli. Bake until the leek has softened. 2. Add the broth, peas and the papeda leaves. Boil the soup until all vegetables have softened, it takes about 5 minutes. 3. Remove the papeda leaves and add the lemon zest and half of the lemon juice. Mix the soup with a hand blender. 4. Season with salt, pepper and the remaining lemon juice.